In this blog, I endeavor to share thoughts about issues that I find timely and compelling - leadership, faith, business issues, recruiting trends, Renaissance Men and Women in the world, Service Academies and their graduates, helping military leaders transition to leadership roles in the business world, international travel, literature, theater, films, the arts and the once and future World Champion Boston Red Sox! 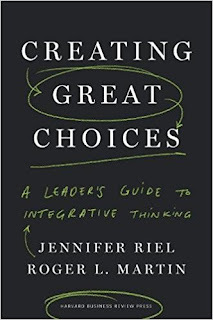 "Creating Great Choices" is one of the most impactful books I have read this year. 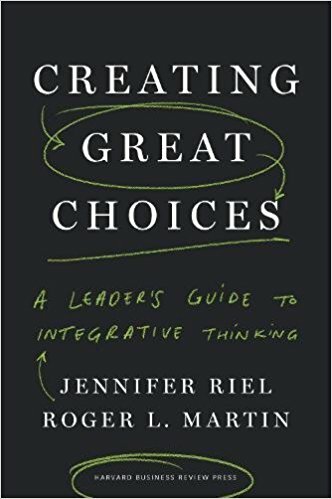 In offering numerous examples of how diverse leaders have utilized the techniques of "Integrative Thinking," authors Jennifer Riel and Roger L. Martin make it easy for the reader to apply the insights to their own leadership challenges. This book stands on the shoulders of "The Opposable Mind," that Martin penned ten years ago. In the intervening decade, Martin and Riel and other members of their team have taught the principles to a broad variety of students - from corporate executives to grad students to high schoolers. The lessons learned from these teaching and learning interactions have been used to craft the structure of this present book. One of the book's first case studies of how Integrative Thinking works in the real world is the story of how the CEO of Lego solved what appeared to be a binary problem. In setting out to have a feature film made about Legos, should the company hire Hollywood A players to craft the film, thereby relinquishing creative control and protection of the Lego brand? Or should they settle for lesser film makers who would allow Lego to retain final script and editing approval. Utilizing this four stage approach, the LEGO CEO came up with a fascinating and ingenious solution. He invited a team of top Hollywood filmmakers to meet with his staff. They made the following proposal: "If we were to grant you complete creative control over a Lego film, would you first agree to spend time with the most passionate Lego customers - at conventions and elsewhere?" The CEO was willing to bet that by hanging around passionate Lego users, the filmmakers would be infected with the enthusiasm and love for the brand of its most loyal customers. He was right, and the result was a film that entertained audiences and enhanced the LEGO brand. This book is not just an examination of the philosophical aspects of how the mind of the leader works, but provides practical tools so that a self-aware leader can learn to think in an integrative manner. It is important for the leader to involve other members of his/her team in the process of finding integrative solutions to complex problems. Insights from the realm of design inform much of the thought processes behind integrative thinking. I have already begun to recommend this book to clients, friends, and proteges.It is impactful and potentially game changing if one is willing to be stretched in new directions. Reading this book will represent a Great Choice!